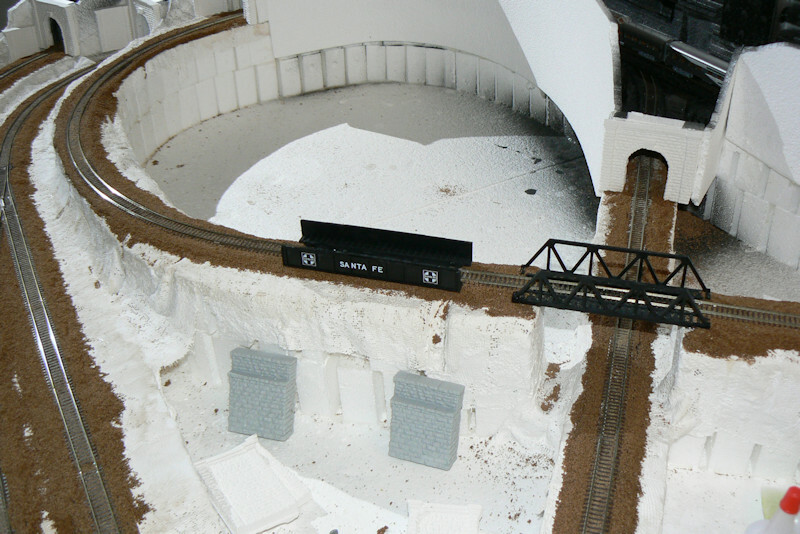 Thanks for reading this article, part 4 of a series about N scale model train building.In the previous article about Track Preparation, Idiscussed in detail all the problems of laying out track, ballasting, and getting trainsto run.In this article I take somewhat of a sideways detour.Looking ahead in my Woodland Scenics Scenic Ridge instructions,I see that next come platforms for the town and factory spaces inside the figure 8 loops.I don't know about you, but I sense that trucks and cars going to and from the factory aregoing to be going up and down a steep incline over the track.I decide to dig a tunnel below the track to make the ascent to the factory much more gradual. 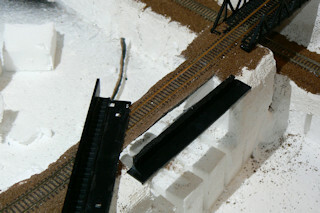 Shown at right is a black steel plate Santa Fe bridge that I will install. 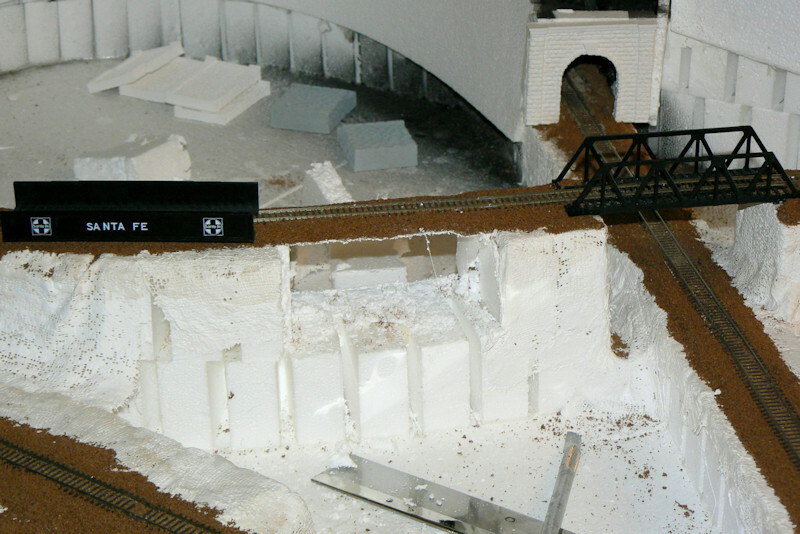 I think the twodifferent bridge types right next to each other will be interesting.The stone abutments will face the tunnels and help support the weight of the 40 ton trains passing overhead. I use a combination of hot knife and razor saw with fine teeth to cut out the tunnelway.The hot knife makes a clean cut into stryofoam, but the heat is not very precise.The saw makes precise cuts but tends to shave the foam and make messy debris that sticksto everything with static charge. Notice that it is very easy to rip away the plaster cloth for remodelling.Also notice that the ballast and black foam bed hold the track in place with no problems. 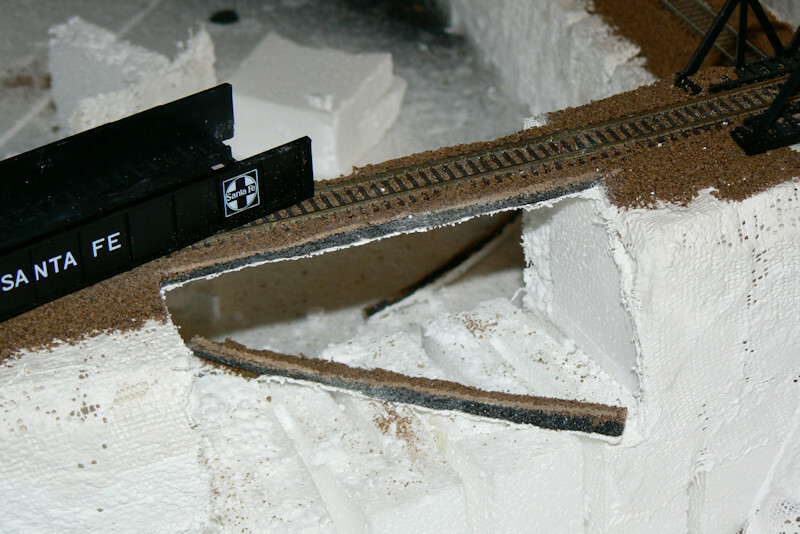 Here I cut away some ballast and black track foam so the width fits within the steelplate bridge. Once again there is lots of dust from this operation. Oh well, I guess I am going to be cleaningsome track once again. 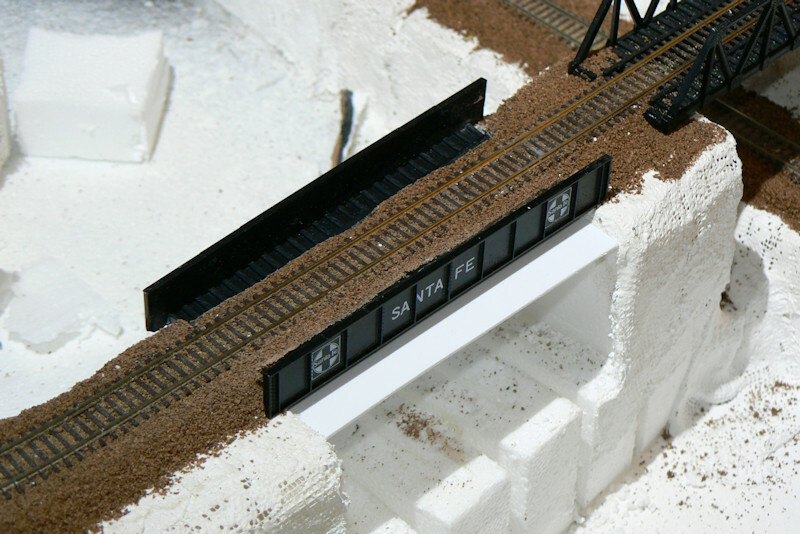 After some cutting I realize that this track is not narrow enough to fit the bridge after all.No problem, I use a Dremel tool to cut the bridge into pieces. I throw away the bottom pieceand will just keep the sides and make my own bottom support. A train layout is kind of like an oil painting.Sometimes as it develops you come across mistakes or other problems that just won't work.What is fun is that you have to imagine your own townfolk, and what they would want, and howthey would fix it.In this case, the townfolk have asked for a new tunnel to the factory.In many respects you must be like the artist Bob Ross and put your happy little trees and tunnelswherever you like. Here I test fit the sides and make a bridge bottom from 1 mm styrene plastic.I will cut it all down to size so you do not see the bottom from above. One of my favorite materials is 30 minute epoxy from Super Glue Corp.(This is the company that also makes Zap a Gap cyano acrylate super glue. )I like the epoxy because it is much stronger than super glue and will not weaken or embrittle over time.The 30 minute working time gives you a little time to work it, hold it, and clamp it into place.The dual syringe is perfect for dispensing the hardener and resin into a soda bottle cap for mixing the perfect amount. 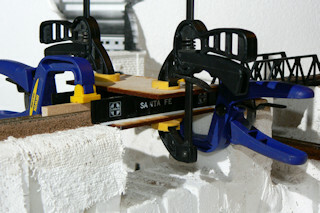 This photo shows all the clamps I use to ensure the epoxy locks the bridge into place.It also ensures the track remains level and the sides and the bottom fullysupport the track. Sorry, I don't have a final photo with the bridge painted and the stone brudge abutments in place.You will have to search some of the subsequent photos to see the final results. Thanks for reading my articles. More train layout photos and articles will be posted in the near future. Last modified: Thursday, 09-Jun-2011 13:07:52 MST.